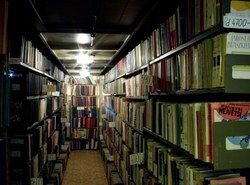 In the connection with the relocation of the collections of the Slavonic Library arising from the revitalisation of the Klementinum, the delivery time of most of the documents deposited in the Klementinum has been extended (with the exception of shelf marks Rd, Rp, publications in the reference library and on open-access shelving). Because of the reconstruction of the Central Depository in Hostivař, all the collections of the Slavonic Library deposited there have been gradually withdrawn from circulation. They will not be accessible throughout the reconstruction, i.e. probably for the entire year 2014. Information on document availability and delivery can be found here. We apologise to all users for any inconvenience that this may have caused.